We aimed to evaluate the prognosis in locally advanced breast cancer (LABC), and the efficacy of neoadjuvant chemotherapy in inducing pathological response in LABC. Despite efforts at early detection, LABC remains a clinical challenge, as distant metastasis develops in most patients, and they will experience disease relapse and eventual death. To study the hematoxylin and eosin-stained slides of pretreatment and post-treatment specimens and correlate them with prognostic and predictive factors. LABC in Egypt showed poor prognostic factors such as a high proportion of the cases have a large tumor size (46%) and axillary lymph node (LN) metastasis (87%) and younger age at time of presentation (median = 53 year). These results indicate a more aggressive biology of LABC in Egypt compared with the same group in developed countries. Negative preoperative LN predicts complete response in postoperative LN. Prolonged survival was observed within the triple-negative (P = 0.004) and progesterone receptor negative groups (P = 0.02). 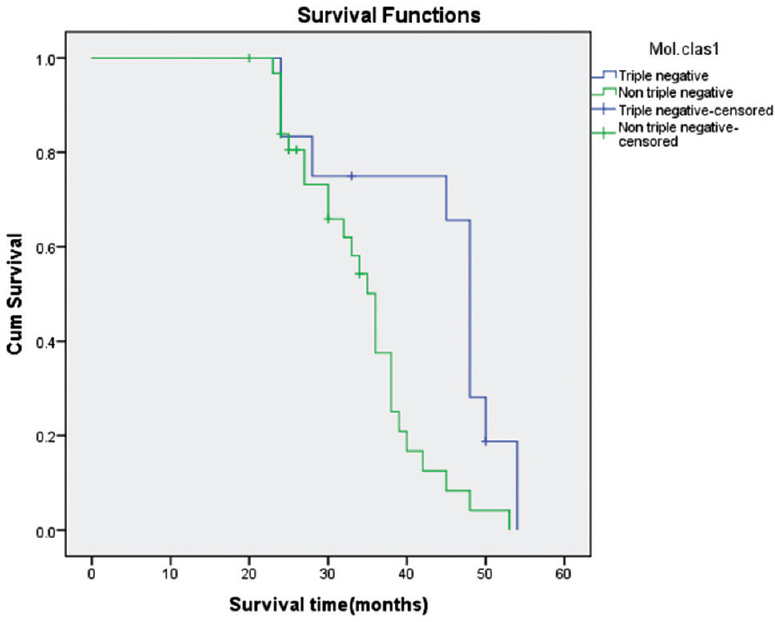 The disease-free survival was shortened in positive lymphovascular invasion (P = 0.04) and high histologic grade (0.03). LABC in Egypt showed poor prognostic outcome. Triple-negative and progesterone-negative cases that received neoadjuvant therapy showed significant prolonged survival. Breast cancer is considered the most common malignancy in women worldwide and comprises 29% of the total new cancer cases and 14% of the total cancer deaths according to latest Cancer Statistics . In Egypt, it constitutes 17% of total malignancies according to registry of Egyptian National Cancer Institute during the period 2003–2004 . Breast cancer is classified into two groups based on therapeutic management: operable and inoperable . Locally advanced breast cancer (LABC) is included in the advanced breast cancer group. 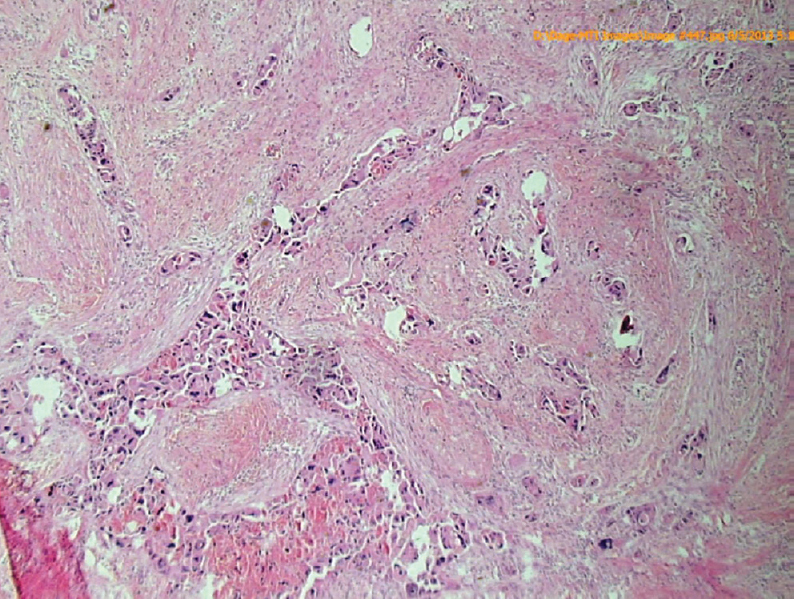 Clinical appearance of this cancer is marked by tumor size of more than 5 cm (T3), with skin and chest wall involvement (T4), or inflammatory carcinoma and/or extensive clinical lymph node (LN) involvement, as defined by the N2 and N3 categories according to American Joint Committee on Cancer (TNM classification system) ,. Treatment of LABC consists of radical surgery, radiotherapy, and chemotherapy with or without hormonal therapy. Neoadjuvant chemotherapy is used in the management of LABC using anthracycline or taxane as the standard therapy . The success of locally advanced breast cancer treatment depends on some prognostic factors. The prognostic factors for locally advanced tumors are similar to the prognostic factors for early-stage breast cancer, with LN status and tumor size having the strongest effects on survival . Other prognostic factors such as histological type, histological grade, and mitotic index also play a significant role in recurrence of the disease and patient's survival . There were not enough data to support the importance of neoadjuvant therapy on improving survival in LABC. The prognostic factors that may influence survival in patients with locally advanced breast cancer also have not been well defined . We aimed to evaluate the prognosis in LABC and the efficacy of neoadjuvant chemotherapy in inducing pathological response in locally advanced breast cancer. We studied 84 Egyptian women with LABC, whose ages ranged from 35 to 75 years, between 2003 and 2012. All studied participants underwent needle core biopsies (NCB). Patients received 4–6 cycles of neoadjuvant chemotherapy, and modified radical mastectomy was performed after full assessment of response and restaging within 3 weeks from the last chemotherapy. Adjuvant radiotherapy and hormonal therapy were administered. The clinical data were collected from the patient's medical records at the National Cancer institute of Egypt. Tumor staging was done according to American Joint Committee on Cancer and the International Union of Cancer Control . The stage was evaluated clinically (cTNM) before neoadjuvant chemotherapy as follows – T (tumor category): the tumor size has been evaluated by either clinical examination or mammogram; N (nodal category): the regional LNs were examined clinically; and M (distant metastasis): chest radiography, abdominal ultrasound, and bone scan were performed for screening of distant metastasis. All of these patients were diagnosed in the Pathology Department at the National Cancer Institute of Egypt. In this retrospective study, the re-evaluation of the histopathological features of the hematoxylin and eosin stained sections of NCB was done to confirm the diagnosis, and in addition to determine the prognostic factors. Immunohistochemical staining was performed using LSAB (labeled streptavidin biotin) immunoenzymatic antigen detection system to visualize the location of antigen/antibody/enzyme complex (Lab Vision/Neo Markers, Fremont, California 94539, United States). Slides were deparaffinized, rehydrated, and immersed in pH 6.0 buffer. Heat-induced antigen retrieval was performed in a water bath at 98°C for 20 min. The monoclonal antiestrogen receptor (ER): Rocklin, California 95677, United States was used. The antibody is ready to use and reacts with a 67-kDa polypeptide. Cellular localization of anti-ER is nuclear. The other monoclonal antibody used was antiprogesterone receptor (PR) PGR Clone 16 (Leica Biosystems, Linford Wood Milton Keynes, MK14 6FG United Kingdom). The antibody is ready to use, and the cellular localization is nuclear. Anti-Her2/neu (c-erbB-2) was also used (CB-11 clone; Cell Marque, Darmstadt, German). This antibody is ready to use, and cellular localization is the cell membrane. Tissue sections were then incubated with these antibodies in humidity chamber overnight. Positive control slides were prepared by staining breast (positive control of ER) by ER antibody, staining endometrium (positive control of PR) by PR antibody, and staining breast carcinoma (positive control of Her2/neu) by Her2/neu-antibody. Negative control slides were prepared by omitting the primary antibody from the staining procedure. The reaction was developed with a diaminobenzidine substrate–chromogen solution, and slides were counterstained with hematoxylin. Stained slides were evaluated by two pathologists who were blinded to clinicopathological data using the Olympus CH2 Light Microscope (Hicksville, NY, USA). Tumors with lost cores, or insufficient tumor in the cores, were excluded from the analysis. According to ER, PR, and Her2/neu results, we classified the tumors as follows: (a) luminal A (ER+, PR+, and Her2/neu−), (b) luminal B (ER+, PR+, and Her2/neu+), (c) Her2 enriched (ER−, PR−, and Her2/neu+), and (d) triple negative (ER−, PR−, and Her2/neu−) . Assessment of the ER-stained and PR-stained slides was done according to the American Society of Clinical Oncology/College of American Pathologist, Hammond et al. : positive if finding of up to 1% of tumor cells nuclei are immuoreactive, and negative if finding of less than 1% of tumor cell nuclei are immunoreactive. Her2/neu immunoreactivity was evaluated by semiquantitive scoring, using a light microscope according to Wolff et al. . The scoring for an IHC test is from 0 to 3+. Positive cases in this study included only the 3 + score. 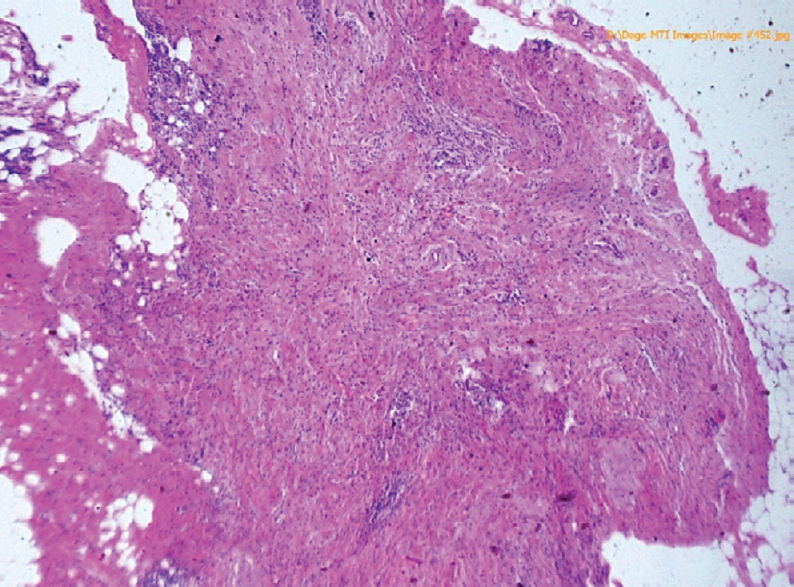 Pathological response in the surgically resected specimen was based on exhaustive microscopic examination of multiple sections from the breast and axillary LNs according to the Miller and Payne scoring system . According to this system, we have divided the histological response to chemotherapy into five grades based on a comparison of tumor cellularity before and after treatment – grade 1:no response, grade 2: up to 30% loss (pathologic partial response), grade 3: between an estimated 30 and 90% reduction in tumor cells (pathologic partial response), grade 4: 90% loss of tumor cells [almost pathologic complete response (pCR)], grade 5: no malignant cells identifiable in sections from the site of the tumor, but ductal carcinoma in-situ may be present (pCR). 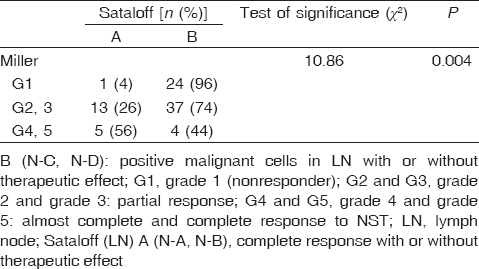 Moreover, using Sataloff method , the pathologic response was evaluated on LN as follows: N-A: evidence of therapeutic effect, but no metastatic disease; N-B: no nodal metastasis or therapeutic effect; N-C: evidence of therapeutic effect, but nodal metastasis present; and N-D: viable metastatic disease but no therapeutic effect. Data were collected, tabulated, and statistically analyzed using a personal computer with SPSS version 16 program (SPSS Inc., Chicago, Illinois, USA). To analyze the descriptive statistics, we used arithmetic mean, SD, percentage, median, and range. For analytical measures, χ2-test, Fisher's exacts test, and Mann–Whitney (U-test) were used. Values were considered statistically significant when P value of at least 0.05. Survival data were collected from the archives of the National Cancer Institute of Egypt. The Kaplan–Meier method was used to estimate the overall survival (OS), and the log-rank test was used to evaluate differences in survival among groups. OS was calculated from the date of primary cancer diagnosis to the date of death or last follow-up. In this study, patients with LABC (cT4, cN0-N2, and cM0), with a median age of 53 years, were included. [Table 1] summarizes the clinicopathologic features, hormonal receptor status, and Her2/neu expression. Regarding the pretreatment tumor size, 31 of 67 cases had tumors more than 5 cm in diameter (46%). Regarding LN stage, most of the cases were N1 and N2 stage, with 58 (87%) of 67 patients. In addition, LABC in our study showed in younger patients, with median age of 53 years. Regarding hormonal and Her2/neu status of studied malignant cases, 50/84 (60%) cases were estrogen receptor positive, 47/84 (56%) cases were progesterone positive, and 11/84 (13%) cases were Her2/neu+. Regarding immunophenotyping classification of the tumors, the luminal type constituted most of the cases with 54/84 (65%), whereas the triple negative constituted 23/84 (27%) and Her2 group represented the least one with 7/84 (9%). 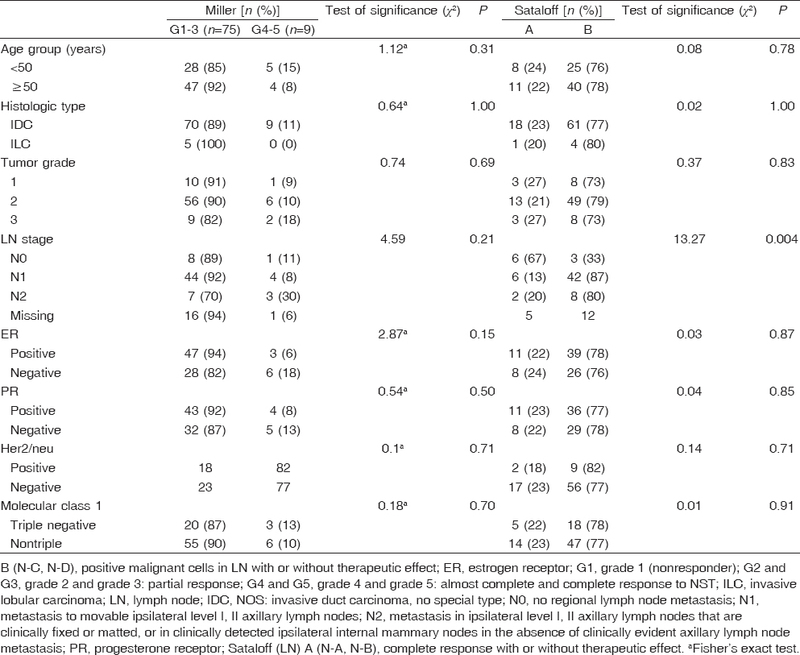 Pathological responses to primary chemotherapy as assessed by the Miller and Payne grading system criteria are summarized in [Table 2]. The grade 4 and grade 5 (pCR and almost complete response) represented the least, with 5/84 (6%) and 4/84 (5%), respectively. Most cases obtained partial response, with 50/84 (59%) cases. 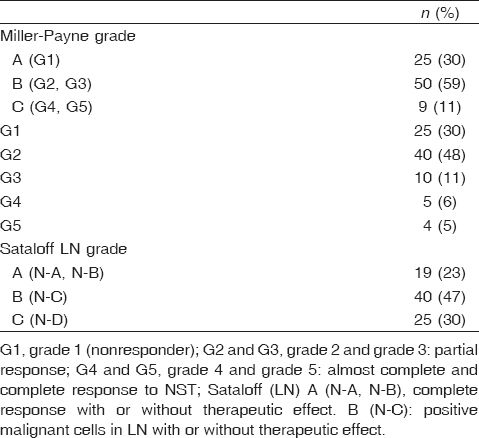 Most LNs after chemotherapy had positive malignant cells (77%) [Table 3] and [Table 4]. There was a significant association between complete response to therapy on the primary tumor and complete response on LN (P = 0.004). Factors predicting OS are stated in [Table 5]. According to the univariate Kaplan–Meier analysis, PR negative status (P = 0.02) and triple negative tumors (P = 0.004) had statistically significant association with longer OS. However, patients with pCR on primary tumor and LN had longer survival, but this did not reach statistical significance. 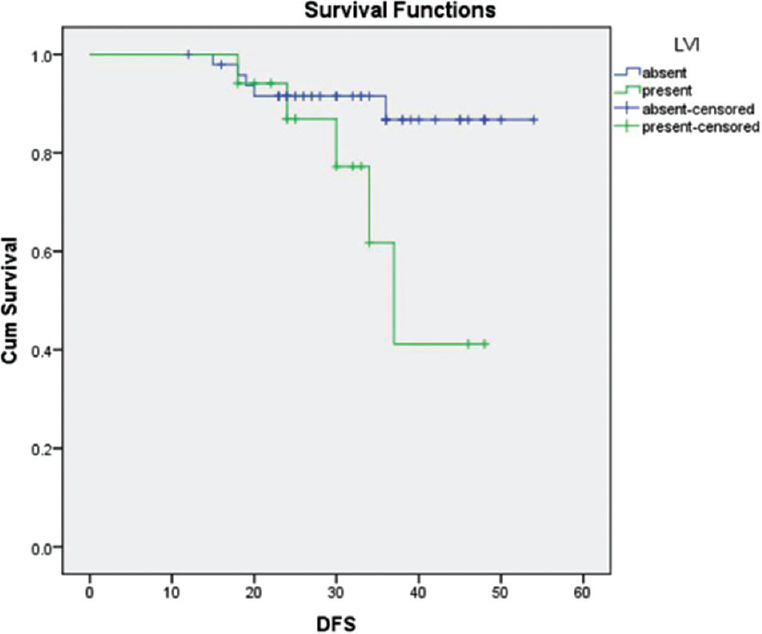 Regarding disease-free survival (DFS), the univariate Kaplan–Meier analysis revealed that absence of lymphovascular invasion (LVI) is associated with better DFS rate (P = 0.04) and lower tumor grade (P = 0.03) [Figure 1], [Figure 2], [Figure 3], [Figure 4], [Figure 5], [Figure 6] and [Table 6]. Figure 1: After chemotherapy, lymph node (Sataloff grade N-A). Figure 2: After chemotherapy (Miller grade 2). Figure 3: Kaplan–Meier overall survival for patients with progesterone receptor positive tumors. 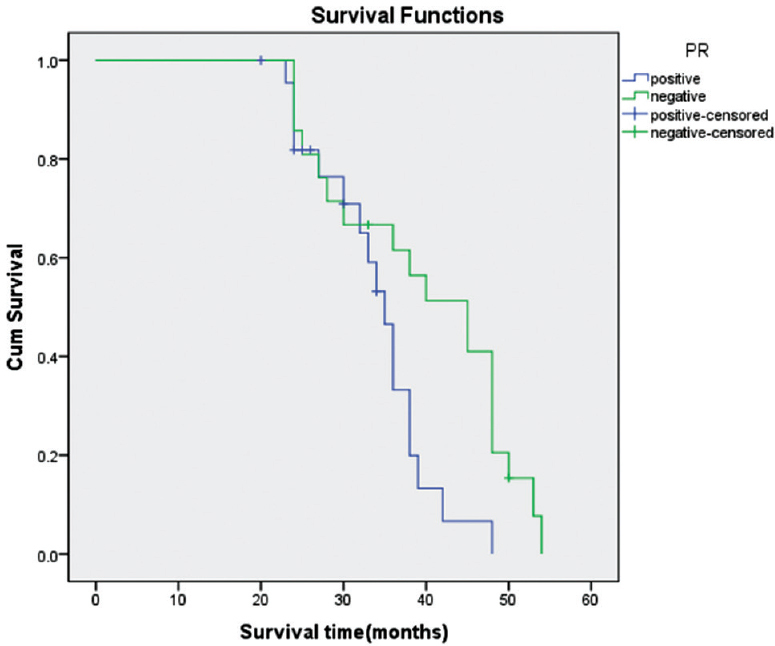 Figure 4: Kaplan–Meier overall survival for patients with triple-negative tumors. Figure 5: Kaplan–Meier disease-free survival. (DFS) for tumor with lymphovascular invasion. (LVI). Figure 6: Kaplan–Meier disease-free survival for tumor grade. Despite efforts at early detection, LABC remains a clinical challenge, as most patients develop distant metastasis , and they will experience disease relapse and eventual death . In the past, many of these patients have been considered to be inoperable, and over the past decade, the use of neoadjuvant chemotherapy has emerged as the standard care for these patients . The incidence of LABC in Egypt represented 33.24% according to the Gharbiah Population-Based Cancer Registry . In other developing Asian countries, it accounts for 50% of all breast cancers ,, which is higher than compared with studies done in developed ones, as incidence in Canada and Denmark was at 10–15% of all new primary breast cancer diagnosis . The explanation of these differences in the incidence is owing to either patient neglection, health system failure, or tumor biology ,. Regarding tumor size, in the current study, 46% of the cases showed tumor size more than 5 cm in diameter. Similar results (36%) were reported by Pierga et al. . Regarding LN stage, most of the cases presented with LN metastasis (87%). In comparison with Pierga et al. , 55% of LABC cases reported N1 stage . However, a larger proportion of the patients with LABC (34%) presented with N2 was reported by another group . In addition, LABC in our study showed presence in younger median age group (53 years) than that reported in developed countries (67 years) . From the pathological data of the studied malignant group, we found that LABC in Egypt showed poor prognostic factors as a high proportion of the cases had a large tumor size and axillary LN metastasis and a younger age at the time of presentation. These results indicate a more aggressive biology of LABC in Egypt compared with the same group in developed countries. We divided our cases regarding immunophenotyping classification of the tumors into the following: luminal A group, luminal B group, Her2/neu group, and triple-negative group. The luminal A constituted most of the cases (60%), whereas the triple negative constituted 27% and Her2 group represented the least one (9%). Our results were consistent with the findings of Angelucci et al. , on LABC cases where luminal A represented the major one (51%), triple negative was present in 14% of the cases, and the least one was Her2 enriched (13%). ER and PR+ was observed in 60 and 56%, respectively, which showed comparable results to studies done on LABC, with 32 and 66%, respectively ,. However, Her2/neu+ was detected in 13%, which is less than that reported in other studies done on LABC (26 and 55%) ,. In this study, the pCR rate evaluated by Miller-Payne system (absence of malignant cells in primary tumor) was 5%; as shown, the pCR rate was obtained in the least percentage of the patients. Approximate results were reported by Pierga et al. and Keam et al. who found a 7–15% rates of pCR among patients with LABC after a neoadjuvant chemotherapy. The persistence of nodal involvement after Neoadjuvent Systemic Therapy (NST) may reflect the presence of systemic micrometastases, which are responsible for the patient's death (Pierga and colleagues) (24). In the present study, the pCR in axillary LN (absence of malignant cells with or without therapy response) was obtained in 23% of the cases. Approximate results were obtained by Kuerer et al. who found pCR in axillary LN after NST in LABC cases to be 26%. All the patients in this study received anthracycline-based chemotherapy and obtained low pCR rate. Lower rate of pCR is accepted with anthracycline-based regimens ranging from 6 to 15% ,. This rate is suspected to increase to 30% with the addition of taxane , and may increase with adding neoadjuvant trastuzumab in patients with Her2/neu + tumors . In the present study, there was a positive correlation between complete response to therapy on primary tumor (according to Miller-Payne system) and complete response on axillary LN (according to Sataloff method) (P = 0.004). Similarly, Kuerer et al. stated that patients with pCR in axillary LN are more likely to have pCR in the primary tumor. To identify the predictive power of some pretreatment clinicopathologic factors on pCR rate, we correlated pathologic response with those factors (univariate analysis). We have found a significant association between a negative pretreatment LN status and good response to NST in the axillary LN (P = 0.004). This association is simply expected, as Pierga et al. stated that number of nodes that contain tumor after NST might reflect the number of nodes involved at presentation. Regarding survival analysis, our findings revealed unexpected significant prolonged survival for patients with triple-negative cancers (P = 0.004) and PR − status (P = 0.02). Similar results were reported in triple-negative patients with BRCA mutations  and with chromosomal extreme instability . Moreover, basal-like phenotype was observed when they achieve pCR to NST . These paradoxical findings can be explained by the effect of chemotherapy which is more effective in this group of patients owing to more aggressive features and increase in proliferative rate. The pCR rate is one of the better prognostic factors that is independent of the initial tumor stage and other prognostic markers . In current study, although patients with pCR in primary tumor and the axillary LN have longer survival time, this did not reach statistical significance. Same results were obtained by Keam et al. in LABC. 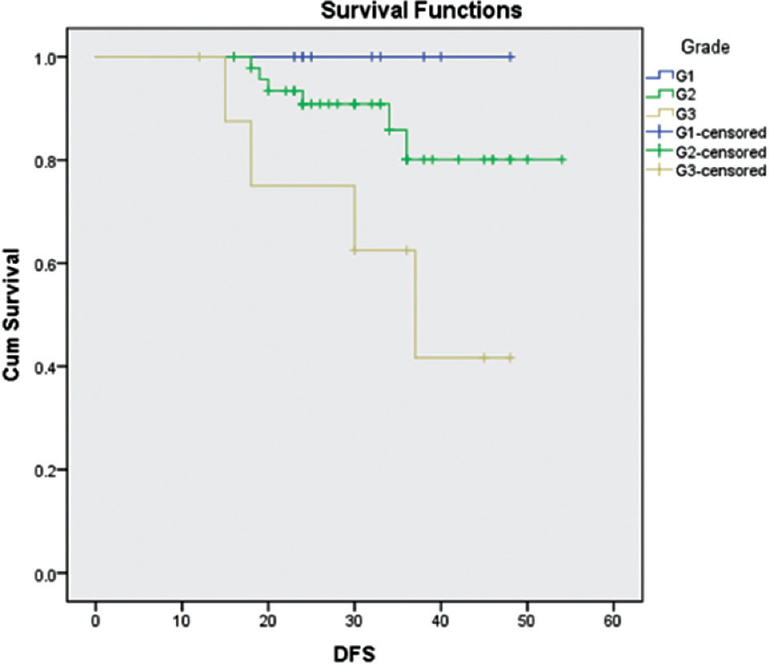 Regarding DFS, the univariate Kaplan–Meier analysis revealed that absence of LVI is associated with better DFS rate (P = 0.04) and lower tumor grade (P = 0.03). Rakha et al. stated that LVI was an independent prognostic factor for DFS. Siegel R, Naishadham D, Jemal A. Cancer statistics, 2012. Cancer J Clin 2012; 62:10–29. Mokhtar N, Gouda I, Adel I. Cancer pathology registry 2003–2004 and time trend analysis. Department of pathology, NCI. 2007. Rustogi A, Budrukkar A, Dinshaw K, Jalali R. Management of locally advanced breast cancer: evolution and current practice. J Cancer Res Ther 2005; 1:21–30. Costa SD, Loibl S, Kaufmann M, Zahm DM, Hilfrich J, Huober J, et al. Neoadjuvant chemotherapy shows similar response in patients with inflammatory or locally advanced breast cancer when compared with operable breast cancer: a secondary analysis of the GeparTrio trial data. J Clin Oncol 2010; 28:83–91. Giordano H. Update on locally advanced breast cancer. Oncologist 2003; 8:521–530. Akhsan A, Aryandono T. Prognostic factors of locally advanced breast cancer patients receiving neoadjuvant and adjuvant chemotherapy. Asian Pac J Cancer Prev 2010; 11:759-61. Akhsan A, Aryandono T. Prognostic factors of locally advanced breast cancer patients receiving neoadjuvant and adjuvant chemotherapy. Asian Pac J Cancer Prev 2010; 11:759–761. Hassa PO, Hottiger MO. The diverse biological roles of mammalian PARPS, a small but powerful family of poly-ADP-ribose polymerases. Front Biosci 2008; 13:3046–3082. Kim MY, Mauro S, Gévry N, Lis JT, Kraus WL. NAD-dependent modulation of chromatin structure and transcription by nucleosome binding properties of PARP-1. Cell 2004; 119:803–814. Hammond ME, Hayes DF, Dowsett M. American Society of Clinical Oncology/College of American Pathologists guideline recommendations for immunohistochemical testing of estrogen and progesterone receptors in breast cancer. J Clin Oncol 2010; 28:2784–2795. Wolff AC, Hammond ME, Schwartz JN, Hagerty KL, Allred DC, Cote RJ, et al., American Society of Clinical Oncology; College of American Pathologists. American Society of Clinical Oncology/College of American Pathologists guideline recommendations for human epidermal growth factor receptor 2 testing in breast cancer. J Clin Oncol 2007; 25:118–145. Ogston KN, Miller ID, Payne S, Hutcheon AW, Sarkar TK, Smith I, et al. A new histological grading system to assess response of breast cancers to primary chemotherapy: prognostic significance and survival. Breast 2003; 12:320–327. Sataloff DM, Mason BA, Prestipino AJ, Seinige UL, Lieber CP, Baloch Z. Pathologic response to induction chemotherapy in locally advanced carcinoma of the breast: a determinant of outcome. J Am Coll Surg 1995; 180:297–306. Singletary SE. Neoadjuvant chemotherapy in the treatment of stage II and III breast cancer. Am J Surg 2001; 182:341–346. Dey S, Soliman AS, Hablas A, Seifeldin IA, Ismail K, Ramadan M, et al. Urban-rural differences in breast cancer incidence by hormone receptor status across 6 years in Egypt. Breast Cancer Res Treat 2010; 120:149–160. Agarwal G, Pradeep PV, Aggarwal V, Yip CH, Cheung PS. Spectrum of breast cancer in Asian women. World J Surg 2007; 31:1031–1040. Akhtar M, Akulwar V, Gandhi D, Chandak K. Is locally advanced breast cancer a neglected disease?. Indian J Cancer 2011; 48:403–405. Pierga JY, Mouret E, Diéras V, Laurence V, Beuzeboc P, Dorval T, et al. Prognostic value of persistent node involvement after neoadjuvant chemotherapy in patients with operable breast cancer. Br J Cancer 2000; 83:1480–1487. Gould J, Fitzgerald B, Fergus K, Clemons M, Baig F. Why women delay seeking assistance for locally advanced breast cancer. Can Oncol Nurs J 2010; 20:23–29. El-Charnoubi WA, Svendsen JB, Tange UB, Kroman N. Women with inoperable or locally advanced breast cancer – what characterizes them? a retrospective review of 157 cases. Acta Oncol 2012; 51:1081–1085. Kuerer HM, Sahin AA, Hunt KK, Newman LA, Breslin TM, Ames FC, et al. Incidence and impact of documented eradication of breast cancer axillary lymph node metastases before surgery in patients treated with neoadjuvant chemotherapy. Ann Surg 1999; 230:72–78. Angelucci D, Tinari N, Grassadonia A, Cianchetti E, Ausili-Cefaro G, Iezzi L, et al. Long-term outcome of neoadjuvant systemic therapy for locally advanced breast cancer in routine clinical practice. 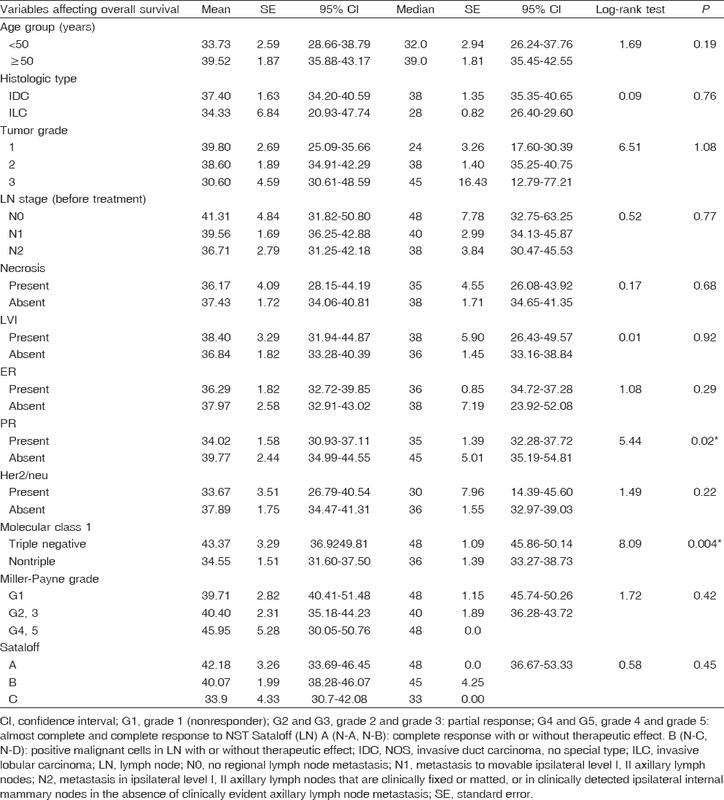 J Cancer Res Clin Oncol 2013; 139:269–280. Bonnefoi H, Diebold-Berger S, Therasse P, Hamilton A, van de Vijver M, MacGrogan G, et al. Locally advanced/inflammatory breast cancers treated with intensive epirubicin-based neoadjuvant chemotherapy: are there molecular markers in the primary tumour that predict for 5-year clinical outcome? Ann Oncol 2003; 14:406–413. Keam B, Im SA, Kim HJ, Oh DY, Kim JH, Lee SH, et al. Prognostic impact of clinicopathologic parameters in stage II/III breast cancer treated with neoadjuvant docetaxel and doxorubicin chemotherapy: paradoxical features of the triple negative breast cancer. BMC Cancer 2007; 7:203. Fisher B, Bryant J, Wolmark N, Mamounas E, Brown A, Fisher ER, et al. Effect of preoperative chemotherapy on the outcome of women with operable breast cancer. J Clin Oncol 1998; 16:2672–2685. Bear HD, Anderson S, Brown A. The effect on tumor response of adding sequential preoperative docetaxel to preoperative doxorubicin and cyclophosphamide: preliminary results from National Surgical Adjuvant Breast and Bowel Project Protocol B-27. J Clin Oncol 2003; 21:4165–4174. Heys SD, Hutcheon AW, Sarkar TK. Neoadjuvant docetaxel in breast cancer: 3-year survival results from the Aberdeen trial. Clin Breast Cancer 2002; 3(Suppl 2):S69–S74. Gonzalez-Angulo AM, Timms KM, Liu S, Chen H, Litton JK, Potter J, et al. Incidence and outcome of BRCA mutations in unselected patients with triple receptor-negative breast cancer. 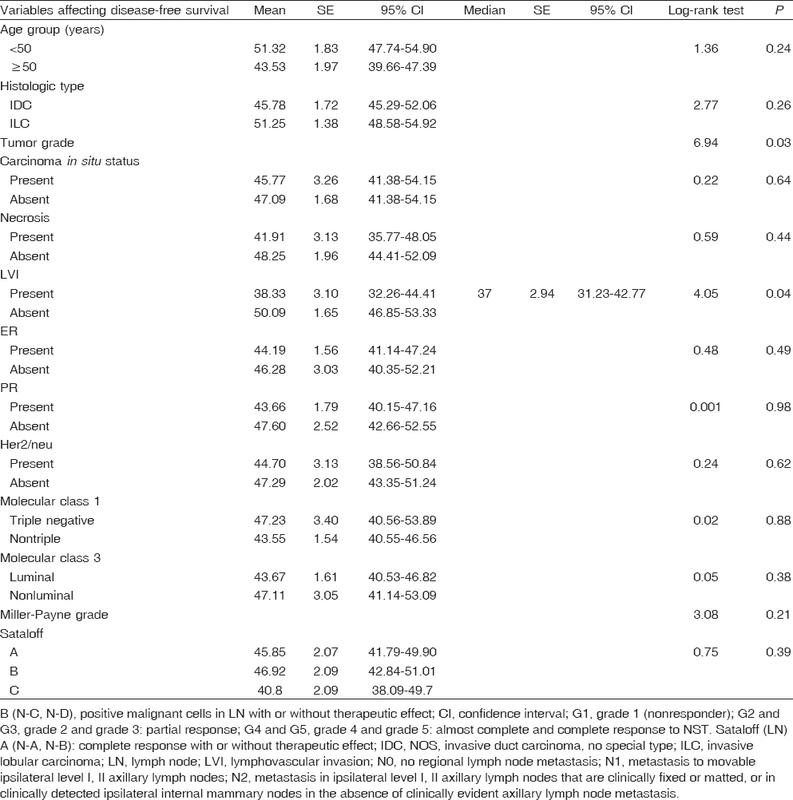 Clin Cancer Res 2011; 17:1082–1089. Birkbak NJ, Eklund AC, Li Q, McClelland SE, Endesfelder D, Tan P, et al. Paradoxical relationship between chromosomal instability and survival outcome in cancer. Cancer Res 2011; 71:3447–3452. Carey LA, Dees EC, Sawyer L, Gatti L, Moore DT, Collichio F, et al. The triple negative paradox: primary tumor chemosensitivity of breast cancer subtypes. Clin Cancer Res 2007; 13:2329–2334. Abrial SC, Penault-Llorca F, Delva R, Bougnoux P, Leduc B, Mouret-Reynier MA, et al. High prognostic significance of residual disease after neoadjuvant chemotherapy: a retrospective study in 710 patients with operable breast cancer. Breast Cancer Res Treat 2005; 94:255–263. Rakha EA, Martin S, Lee AH, Morgan D, Pharoah PD, Hodi Z, et al. The prognostic significance of lymphovascular invasion in invasive breast carcinoma. Cancer 2012; 18:3670–3680.